Kentucky from 17–24 July 2013. These summer workshops have become internationally known for providing a stimulating occasion in which participants can live for an extended period of time in an all-Latin environment, speaking and hearing no language but Latin. 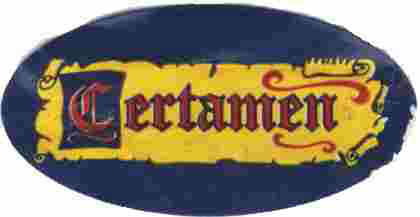 In 2013, the Conventiculum Lexintoniense will celebrate its seventeenth consecutive year. From the inception of the Conventiculum to the present time its organizers have been, and are still refining, revising and adding to the Conventiculum’s range of activities - all with a view to enhancing the experience of those who take part. 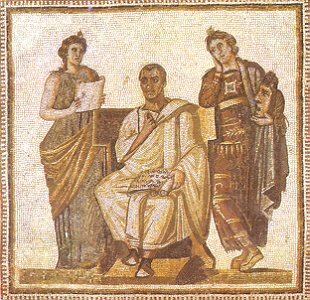 First-time participants and people new to spoken Latin are especially welcome, and the Conventiculum features special sessions designed with these people in mind. The Cathedral School of St. John the Divine is looking for a full-time leave replacement Latin position. The person will teach two sections of sixth grade, two of seventh, and two of eighth. The sixth grade classes meet twice in a six-day cycle, while the seventh and eighth grade classes meet four times in the cycle. It is a total of 20 class meetings in the six days. We estimate that the position will last from six-12 weeks, and it will start on Monday, November 19. The text is Jenney's First Year Latin, and it is used for all three years. For more information or to apply, please contact Kevin Roth, Head of Upper School at kroth@cathedralnyc.org or at 212-316-7578. "This is a talk given at the CAES meeting by Chris Choquette, a student of Hans Mueller at Union. It is a very concise overview of Caesarean background info and people wondered whether we couldn't post it on the website." 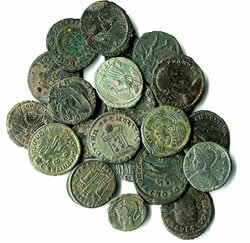 Registration for CAES members is $50.00. This year for the first time you may register, and pay, online! If you prefer to complete your registration via the postal service, that is also an option. Below is the proposed schedule for the CAES Fall Institute (Oct. 5-6), held in New York City in conjunction with the Classical Association of the Atlantic States (CAAS) which will offer concurrent sessions open to all registrants. resume to Juan C. Méndez, World Language Supervisor K-12: jmendez@nred.org. The Bronx School of Law and Finance, a small unscreened public school in New York City, seeks a certified Latin teacher for 9th grade introductory Latin for the 2012-2013 school year. The text used is Ecce Romani, but development of original materials to meet the needs of diverse learners, including students with special needs, is strongly encouraged. Please forward a cover letter and curriculum vitae to Principal Dr. Jessica Goring: jgoring@schools.nyc.gov. Interviews commence immediately. The fall institute will take place in conjunction with the Classical Association of the Atlantic States, October 4-6. The final prices for meals and such are still being negotiated, but since it is in NYC, I want to encourage you to make arrangements for your stay. 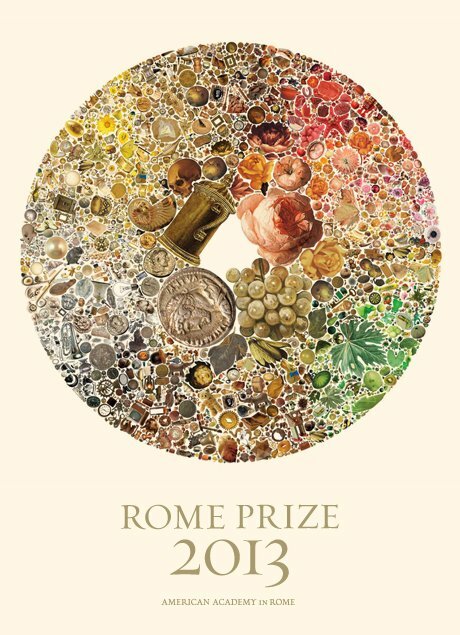 The American Academy in Rome invites applications for the Rome Prize competition. One of the leading overseas centers for independent study and advanced research in the arts and the humanities, the Academy offers up to thirty fellowships for periods ranging from six months to two years. Rome Prize winners reside at the Academy’s eleven-acre center in Rome and receive room and board, a study or studio, and a stipend. Stipends for six-month fellowships are $14,500 and stipends for eleven-month fellowships are $27,000. The University of North Carolina, Greensboro now offers an all-online M.Ed. degree in Latin. It is a part-time program designed for Latin teachers who already have obtained initial licensure. The program concentrates on the study of Latin language and literature, with additional study in the areas of history, classical civilization, and professional education. CAES would like to invite all its members and friends to gather and grow in a relaxed atmosphere this summer. Our plan is to provide an opportunity for everyone to share their ideas and learn from each other informally and/or in some more organized fashion. Think Latin summer camp where the participants set the agenda. The Brooklyn Latin School (TBLS) is one of New York City’s eight specialized (i.e. exam) high schools, offering a classical, liberal arts education. A replication of the prestigious Boston Latin School, TBLS was founded in 2006, and all of its upper class students are enrolled in the International Baccalaureate Diploma Program, a challenging two-year course of study widely recognized by the world’s leading universities. We are presently seeking results-oriented teachers who exhibit effective leadership, thorough content knowledge, a reflective nature, a strong work ethic, and an appreciation for the discipline of teaching. 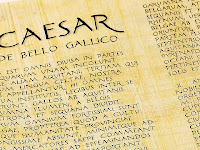 Integrating technology in the Latin classroom is a powerful way to increase student achievement and augment engagement. This weeklong workshop will address the many ways that current technology can enhance and enliven the Latin classroom. Participants will have the opportunity to explore a variety of technologies that are valuable additions to both the elementary and advanced Latin curriculum. The workshop will address methods and tools for building vocabulary, teaching language skills, and integrating history and culture. The focus will be on using free or inexpensive web-based tools (Prezi, the Google suite, Popplet, social networks, animoto etc.) that work on various computing platforms to create media-rich lessons. Mark your calendars! The annual JCL Fall Festival will be held at Albion High School on Saturday, October 27, 2012. Hope to see you there! Or celebrate them in Latin class! 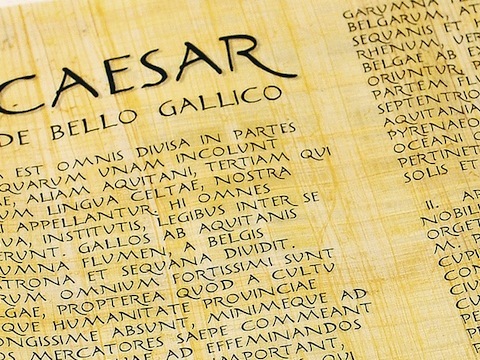 What activities do you do in your Latin class in honor of this important date in Roman history? Eugepae!! 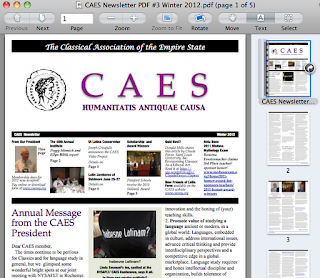 The first digital version of the CAES Newsletter is now available! Click here to download the Winter 2012 edition. Please forward to Ellyn Bibik (esbibik@gmail.com) or Joanne Melton (jmeltoncaes@yahoo.com) any news you have for future newsletters. National Latin Teacher Recruitment Week asks as many educators as possible across the nation (and beyond!) 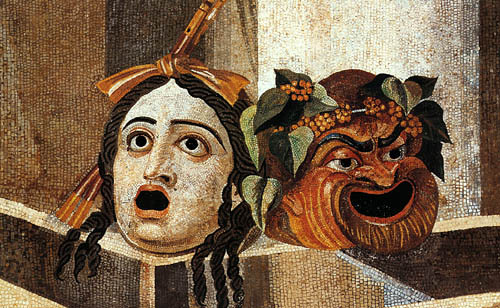 to find one day to talk to their students about becoming secondary Latin teachers. NLTRW was created to address the Latin teacher shortage that we are facing in this country. The demand for Latin continues to grow, in great measure due to our own best efforts to raise awareness about the importance and richness of the study of Latin. Now that we have created the demand, it is time to create the teachers. NLTRW is scheduled for the first full week in March, but if you cannot speak to your students that week due to testing or holidays or whatever, just pick another day of another week. The most important thing is to talk to your students about becoming teachers. For more information, including ideas, free posters to download, and funding opportunities, point your browser to promotelatin.org and click on the NLTRW link. 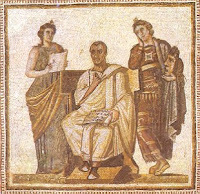 The University at Buffalo, SUNY (UB) Department of Classics will host a three-day spoken Latin workshop for Latin instructors and others interested in conversational Latin on the UB north campus from June 27-29, 2012. The 2012 Annual Institute will be held in New York City on October 4-6. Planning of the Institute is well under way, and it is not too early to consider getting involved! If you are interested in putting on a workshop at the Institute, please submit your proposal online.